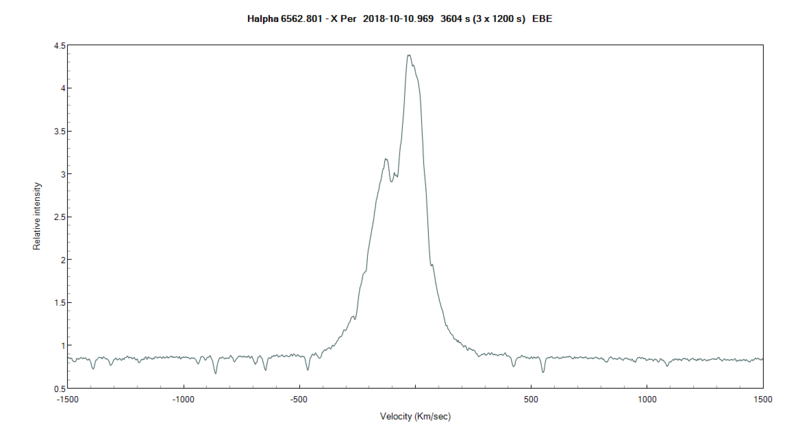 I have received via the BAA a request for spectra of X Per from Dr Paul Roche, Cardiff University. X Per is an X-ray binary where material from a Be star disc accretes onto a companion neutron star. It is Vmag 6.7 so bright enough for high resolution spectra. It is not in BeSS currently as it is not considered a "classical" Be star system but if anyone currently monitoring Be stars could add it to their list he would be grateful. He is looking initially for high resolution H alpha spectra to monitor the state of the disc. Spectra can be added to the BAA or ARAS databases and any changes in disc state seen should be announced here and direct to Paul or me. I'd like to (re)start a monitoring programme on the Be star X Persei, the optical counterpart to the X-ray pulsar system 4U0352+309. This is an unusual X-ray system, with a slow pulsar (~14 mins spin period) in a wide binary (~250 day) orbit, which exhibits phases where the Be star loses it's circumstellar disc (characterised by unusally faint periods where the primary fades to V~6.9-7.0). X Per is generally a bright B0e star (V~6.4-6.7), and I'm interested in setting up a long term monitoring project to try and follow the system through it's next disc-loss phase. 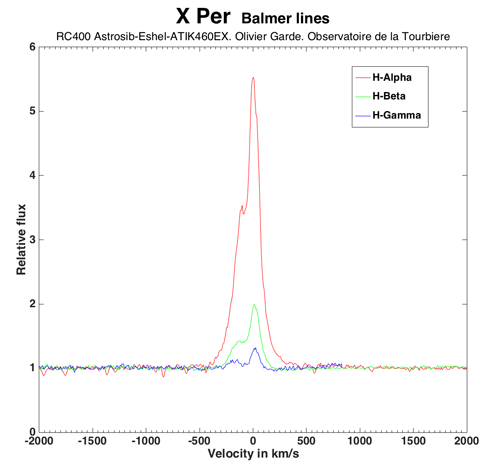 I did this in the 1990s (as part of my PhD) and it was very successful, and with the growth of amateur spectroscopy I'm keen to see if we can keep tabs on the behaviour of the H alpha line as well as on the photometric behaviour, as this line is a strong indicator of the state of the circumstellar disc that gives the Be star it's "e". 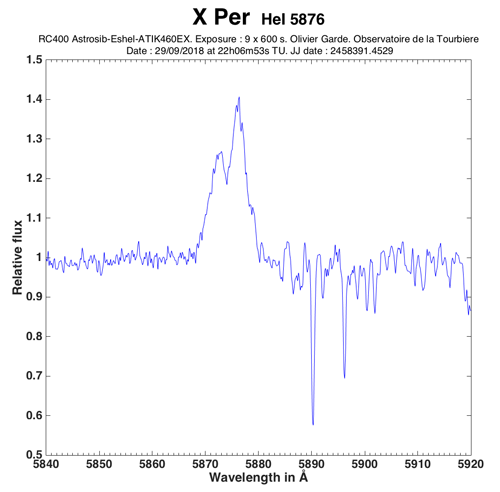 In BeXRB systems (and X Per in particular) the H alpha emission and IR excess are exactly as would be expected from a standard Be star, and the neutron star accretes from passage through the outer regions of the disc (leading to transient emission), so a system like X Per can be considered and monitored in exactly the same way as a single Be star. Changes in the disc have an impact on the X-ray behaviour of the system, as the neutron star is influenced by changes in the size and density of the disc (which is where it occasionally accretes, once the disc reaches the distances of the neutron star orbit). So monitoring the disc emission provides a clue as to the future behaviour of the X- ray source, and I'm hoping that a monitoring programme can help predict X-ray emission when we start to see signs of disc growth and then loss. Ideally I'm looking for as much UBVRI photometry as possible over the next few years, with any H alpha spectroscopy an added bonus. The system has long period variability, but short period (minutes) changes in both photometry and spectroscopy have been noted previously. I'm going to be setting up a monitoring programme using the Faulkes Telescope Project (via the Las Cumbres Observatory facilities, mainly the 0.4m 'scopes in the network as this is a bit bright for a 2m! ), but having additional data would be fantastic and would be really valuable in helping to monitor the overall system on timescales of weeks-months-years, and correlate with X-ray behaviour in particular. H alpha line profile and the overall spectral shape, and/or just the EW of H alpha, would be useful - H alpha (as high res as possible) is really what I'm after at this point as it's usually the best indicator of disc behaviour, but any data that can be gathered would be great. I'm hoping to get a Masters student to look into all of this over the next year, and then each year after that, as it seems to be an unusual system even amongst the Be stars, and also amongst the BE/X-ray systems! That's great Olivier ! Can you post it to the BAA and/or ARAS databse ? EDIT: I see it is already in the BAA database. Thanks! Le spectre d' X Per ont l'envoie à quelqu'un pour la campagne d'observation ? It uses the BeSS standard and the conditions for use are similar to those in ARAS. The BAA have been collecting and storing variable star data since 1840 so it should be a good place to preserve the data for the future.